This is a big post today not only due to the amount of polishes but I also have some big news. Ever since I started blogging, and especially ever since I got my DSLR, I have pinned after a true macro lens. I was finally able to make that goal happen and started practicing with it the moment it arrived. I’m really impressed with how much sharper it’s making my images. My other big news is I decided to take the plunge with creating a YouTube channel for this blog. It was on the bucket list of things I wanted to add to my blogging journey. I don’t foresee me abandoning this place as the central place for my blogging but rather I want to use YouTube as an enhancement to what I already do here. There are times where I discuss a topic that would be better illustrated in a video than in written words so now I will have the ability to add videos to my blog posts. I made a simple slideshow to show off the polishes I will be reviewing in this blog post. I figured I should start simple and work my way up to more elaborate videos as I learn. Today I have the crème polishes from the Southland Sunsets collection by Baroness X. This isn’t a new collection from Baroness X but they were recently rereleased which I was pretty excited about. There are also two glitter toppers that are a part of this collection and I will be showing them to you in another post. There are eight crème shades in this collection so I will hop to it. All polishes in this post are shown without topcoat. All eight of crème polishes dry to a satin finish which I rather like for these shades. They look amazing with glossy topcoat as well. First up is this bleached neon lemon shade. If you remember my review of China Glaze’s Lite brites collection you may recall the bleached neon yellow, Whip It Good. Laguna Lime is similar to Whip It Good but is a bit more bleached and leans ever so slightly more green than Whip It Good does. I feel the formula on Laguna Lime is ever so slightly better as well which isn’t saying a whole lot because both polishes had pretty good formulas. Laguna Lime leveled out amazingly and didn’t really need a topcoat. The polish was fully opaque in two coats. It’s almost completely opaque in one coat but a second intensifies the color and evens everything out. As you can see in my macro photo Santa Monica Mint dried a bit brighter and more yellow toned than the color that is in the bottle. This is really that bleached neon grassy, lime, green. If you want a warmer toned bright green this will be the one to get. This is another flawless formula that was opaque in two coats and leveled out perfectly. Who doesn’t love these pink leaning coral shades during the summer? For those curious, Malibu Melon is more bleached than Virago Varnish’s Malibu. They’re similar but different for sure. I can’t decide if this shade is a coral leaning pink or a pink leaning coral. Sometimes you can really peg a color as leaning more on one side than the other but Malibu melon is really pretty much right in the middle of coral and pink. Now this is the pink I have been waiting for all summer. Pallasades Pink is one of the brightest colors in the collection and I would almost call this more of true neon than bleached neon. This isn’t eye searing but it is pretty bright, especially when you step out into the sun. I wanted that perfect cool toned pink for summer and this just may be it. We are starting to get into some of the darker shades in the collection. However, calling them darker feels wrong because none of these colors are actually dark by definition. This is the first of polishes that some people may be able to get away with one coat depending on their personal application. I used two because I liked the look of two coats. Venice Beach Violet is halfway between pink and purple. I call Venice Beach Violet my neon raspberry sherbet shade because that’s what it reminds me of. 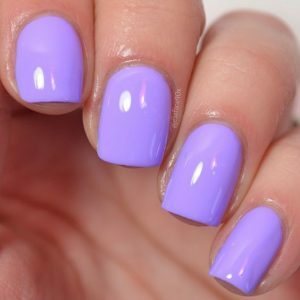 This is a beautiful warm toned orchid purple. Next to the blue shades Venice Beach Violet looks pink. But next to Pallasades Pink and Malibu Melon Venice Beach Violet looks purple. This is another one of the polishes that could almost be a one coat polish but two coats made it perfect. Periwinkle is one of my favorite colors but it’s very difficult to find in a bright summer version. That’s why I was so excited to see Point Dune Periwinkle as part of the Southland Sunsets collection. This is certainly more of a purple leaning periwinkle than a blue one but I don’t mind one bit because I love this shade. Yes, this one also has that incredible formula that is almost a one coater but I did two to make it flawless. 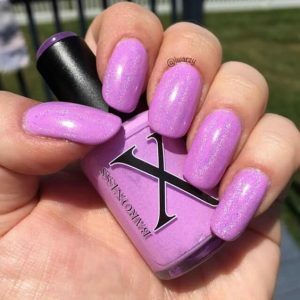 You don’t see colors like this too often in bleached neon collections and it’s a must have for purple polish fans. This is more of an aqua blue than a true teal shade. However, it’s still gorgeous. In my opinion, Topanga Teal is one of the least neon of the crèmes but it is still pretty bright and very summery. I would almost call this a darker pool blue but aqua is pretty spot on. I was able to get Topanga Teal fully opaque in two coats. I didn’t have any issues at all with the formula and it leveled out great just like all the others. I would call this the blue leaning periwinkle in the collection but settled on a super saturated medium sky blue. Even though latigo Indigo is the darkest color in the collection it is, by no means, dark, and is one of the brightest shades in the collection. Latigo Indigo practically glowed on my nails, especially in sunlight. This one was the closest to being a one coater of all the polishes, but again, I used two for full color payoff. In the bottle Latigo Indigo doesn’t seem like it’s going to be so bright but once I got it on my nails it was incredible. I have yet to be disappointed by Baroness X’s polishes and this collection made me even more excited about the indie brand. I really like the flat brush with the rounded tip that baroness X uses in their polishes. It makes it very easy to apply the polish and I didn’t have to do much cleanup at all to get that perfect curved edge down by my cuticles. The brushes are reminiscent of the ones in Sally Hansen’s Miracle Gel. I have wider nail beds so I really like that style of brush but those with narrower nail beds may not be as big of a fan. You do have to be careful when pulling the brush out of the bottle because the neck is a bit narrow for such a wide brush and you can easily get polish on the threads of the neck. But that’s really the only semi negative thing I can say about the polish or packaging. As I said in each polish’s description the formulas were pretty consistent across the board and were very easy to use. This is one of he reasons I love indie crèmes. The crèmes in the Southland Sunsets collection are excellent by crèmes standards but the fact they are bleached neons and brights makes me admire them even more. I own a lot of neon polishes so I did have a few similar polishes and a couple that are close enough to qualify as dupes. But the fault for that lies completely on me for being a neon polish hoarder. I’m okay having similar colors, especially ones with such great formulas. The Southland Sunsets collection is still available on the Baroness X website. Some of the shades are sold out and I don’t know if they will be restocked this year or not. So if there are shades you like you better grab them if they are in stock. If I had to pick a few favorites from the Southland Sunsets I would pick the cooler half of the collection (Pallasades Pink, Venice Beach Violet, Point Dume Periwinkle, and Latigo Indigo) because I don’t have anything like them in my collection and I, generally, gravitate towards cooler toned colors. I’m pretty sure this collection will make it onto my all time favorite collections list. Which shades did you like the best?